Anyway I had fun with this one...I mean, it's nothing exceptional, but doing the cleanup and the cell shading (which I haven't done in a long time) was a good practice. I certainly came out of my comfort zone for once. Colored sketches are always the best! XD I was thinking of coloring the sketch again, but then I wanted to clean it up to try and making it actually look like a screenshot...not sure I succeeded though. EDIT: I forgooot!! As you can notice, I once again drew Padmé with...I don't know, normal hair?? XD I think she looks way better like that the funny thing is that I was thinking "I hope she doesn't look like Katara " because last time I drew her this way people said she looked a bit like Katara from Avatar: The Last Airbender...then I thought..."OMG but this scene I'm drawing looks familiar...where the hell did I see that?" and THEN I remembered. It was the scene on the Season 2 finale of ATLA in which Katara touches Zuko's scar. Lol epic fail. Subconscious is a powerful thing. Hopefully the next season of The Clone Wars won't change anything about this story. I love the Clone Wars micro series to death, I love your take on those iconic scenes. 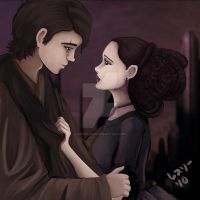 I like your picture, but I have to admit I didn't like Anakin and Padme. It's like they couldn't get their heads out of their...yeah. Anyway. It wouldn't have had to be so hard for them if it hadn't been for those cold Jedi rules about no love or attachments. Maybe he should have just said the hell with it and quitted the Jedi order and went away with padme to naboo like she wanted him to do. And then the twins happend! How sweet! She cares a lot about him! OMG!!! Have you watched the legion of superheroes 2006 WB series??? The Anakin you made looks like my 2nd favorite superheroe LIGHTING LAD IN THE SECOND SEASON OMG!!!! HE LOOKS AWESOME!!!! AND he also has a scar in his left eye!!!! Definitely my favorite moment of the old series. Something about the idea of a disfigured soldier returning home and his wife staying really appeals to me. Unconditional love at its most conditional. I liked the drawing style, it reminded me of Samurai Jack (both created by the same man). But I like the husky, brawny build you've given Anakin. More of a contrast to his son, who had a slimmer build (and makes the Vader Suit more believable). I much prefer your Anakin to canon-Ani, yours looks like he can emote beyond a temper tantrum! You're right, overall it is a nice scenario!! And thank you very much!! I'm very glad you like my Anakin! The old clone war series is so much better than the new one >.< Great picture!!! It is lovely! beautiful! i loved that scene in the old Clone Wars. This is so beautiful. I really like your style and I'd love it if they redid the cartoon this way. Loved this scene from the old series! Grate job!!! I think yours looks way better than the original! Lovely job on their expressions and the shading and everything! If the whole series was done in this style it would be amazing! I've been tempted to watch it but I also am not really keen on the style. Haha! Thank you so much for the great compliment! We should make a petition for Disney or something! XD PLEASE MAKE AN ANIMATED MOVIE OF STAR WARS! Hahah!! Thank you so much!! Yay!! Me too and ur welcome! Oh wow! This totally looks like a Disney screenshot! Awesome work! I really like how redid the scene kind of. Really beautiful! I remember this scene Great job!